This morning I was at a stuck point on what to cook for breakfast. I had just came in from doing a 10 mile bike ride, took a shower, helped my kids brush their teeth, and at that point I was just ready to eat. We do not usually have meat on the menu so sausage and eggs was out. I didn’t want the same ol eggs and potatoes or eggs and toast. I decided to make a frittata, but add in a starch other than potatoes. We usually have my favorite, Skillet Breakfast & Dinner Potatoes or Oven Bag Breakfast Potatoes. I decided to throw in another favorite of mine, Plantains. Note: You can pretty much use any veggies you like to load your frittata. I am just sharing what I used in mine. I would have added Kale or Spinach if I had any. Seasonings: Salt, pepper, light adobe all purpose seasoning. Note: I normally have pictures to go with the steps, but again hunger took over. I will make again an update with pics later. Preheat oven to 350. Spray baking sheet with non-sticking cooking spray. Place cut plantain in rows. Allow to bake for 20 minutes, flipping at 10 minutes. Heat canola oil in skillet on medium low. Add garlic and ginger first for 1-2 minutes. Then add all your veggies, except for avocado. You might be inclined to call it a vegetable, thanks to its green hue and savory taste, but the avocado is technically a fruit, and even more specifically, a single-seeded berry. Cook veggies for about 5 minutes. Meanwhile whisk eggs in a bowl and add seasoning, cheese, and avocado (or save avocado and add later as a topping). Combine eggs and cooked veggies. Pour mixture into a 10-inch baking pan. Layer the baked plantains on top. Bake in oven for about 30-40 minutes; until the mixture is firm in the middle. 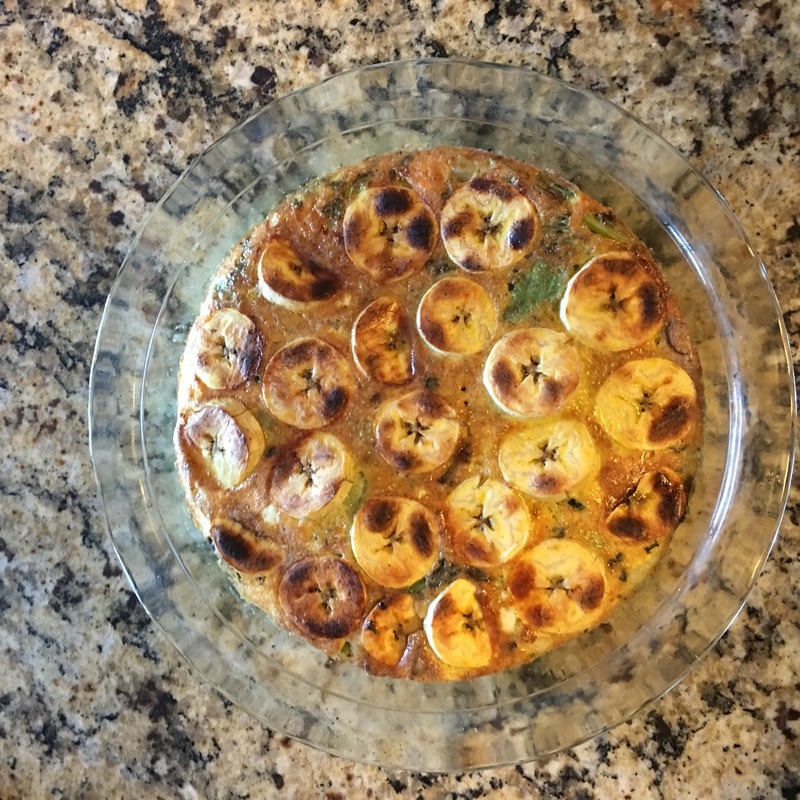 Note: When I make frittatas I usual put on broil, but this browned my plantains a little more than I liked so baking is preferred for this.